Tropezia Palace Casino :: Wonky Wabbits™ video slot – PLAY NOW! NetEnt is releasing a new game Wonky Wabbits™. It is a 5-reel, 15-line video slot with some fun and exciting features, “Win Both Ways” and a “Wild duplication feature”, this feature will take any Wild that appears on the reels and duplicate it in the areas that result in the best possible win for the player. The game is set in a vegetable garden where the hungry rabbits wait for Wilds to appear on the reels. The Wild duplication is when the excitement sets in and a wild appears on the reels, now the hungry rabbit moves from the Wild symbol and burrows tunnels under the reels to appear on the symbol where the best possible win will occur. The Wild symbols can appear on all reels. Two stacked Wilds can appear on reels 2 and 4 only. So that means players can get up to 14 wilds to appear on the reels after wild duplication have occurred. Simple math, more wilds more hungry rabbits and bigger wins! 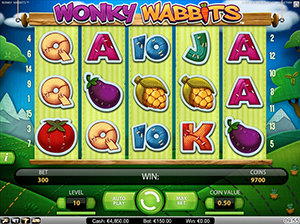 Wonky Wabbits™ :: You can try this NEW Slot game right now at the following casinos: ZonCasino, iGame Casino, Monte-Carlo Casino, Jetbull Casino, Unibet Casino, Vera & John Casino, ComeOn Casino, Mr.Green Casino, EuroSlots Casino and RedBet Casino.